Travel Blog about tourist places and hotels/resorts around Delhi in North India. Emphasis on offbeat places and special tips about travelling in and around Delhi. Weekend Getaways from Delhi. Around Delhi team is organizing an all inclusive trip to Rishikesh for rafting on the Long weekend of Good Friday 14th-16th April 2017. This is an opportunity for friends and family to travel together and enjoy stay and various adventure activities like rafting, trekking, beach volleyball etc. 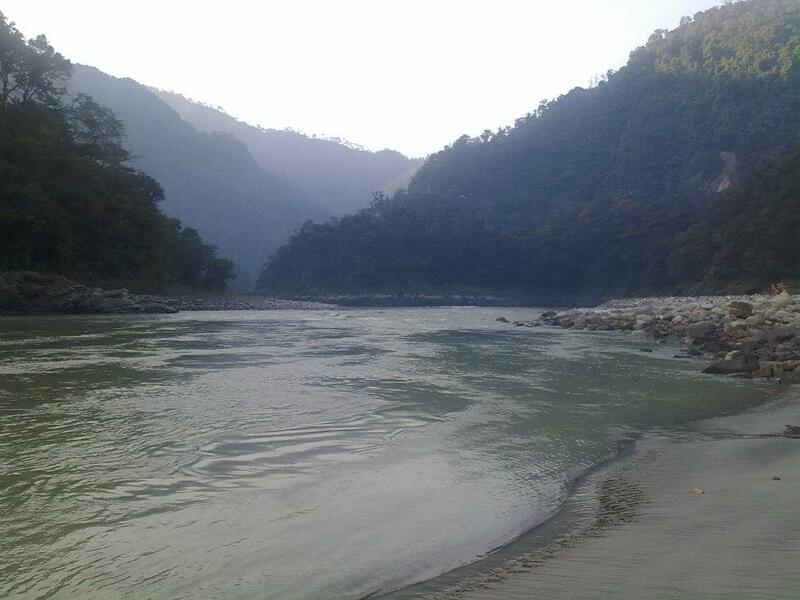 The camps are in jungle area on a hill close to the River Ganga, Rishikesh, very close to nature but are easily reachable about 15 km from Rishikesh and 250 from Delhi. 6 AM 14th Apr 2017Friday - Leave from Delhi, Dhaula Kuan in 27 seater/Tempo Traveller on a shared basis. Mineral water one each for travel. 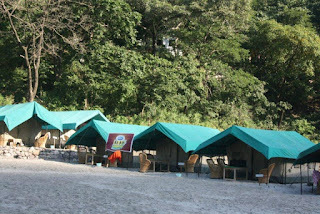 1 pm Reach the camps , welcome drink on arrival, Chk in the camps on double/triple sharing as booked. 8:30 AM Set out for marine drive for rafting after instructions. Explore the beautiful surroundings and attend a briefing on rafting techniques. 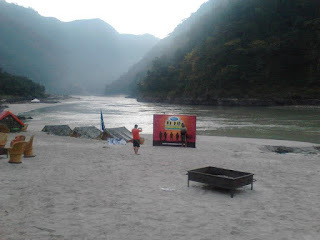 The group would then raft down from Shivpuri to the Rishikesh through exciting rapids like Return to sender, Roller Coaster, Golf Course, Club house, Body surfing, Tea off, Initiation, Double trouble. One would also get a chance to try their hand at the exciting sport of Cliff Jumping and Body Surfing. We Complete the stretch at Rishikesh & Back to camp. 3 PM onwards- Time at Leisure or you can enjoy activities at the camp. An optional activity of Bridge slithering/Rapelling can be arranged for those interested at extra charges. 7 PM Reach Delhi- End of Trip. The camps used are one of the best in Rishikesh, located about 16k from Rishikesh near Shivpuri. The camps can be reached easily and without any difficult descent or climb from the main road, you don't have to carry your luggage also the camp which will be done by our vehicles to the camp. The tents are large with sitout areas and can easily accommodate 3 people. These are one of the few camps which has running water English toilets with provision of shower bathrooms. Electricity is available with a fan in the tent along with a charging point in each tent for mobile. Food has been liked by all our guests. Around Delhi the organisers of this trip are 'Around Delhi Holidays Pvt Ltd' completing 15 years in business of travelling and arranging trips. 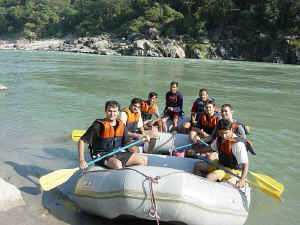 We have the distinction of arranging one of the largest camping and rafting group of about 250 people recently. Inclusions- Stay in tents for 2 nights, 3 bfast, 3 lunch, 2 dinners, 3 evening tea, 2 evening snacks (veg+ non veg), rafting and adventure activities as per itinerary above, transfers Delhi-Rishkesh-Delhi in A/c vehicle ( A/c will not work beyond Rishikesh). One mineral water bottle each in transfers Delhi - Rihikesh and on return. Anything not mentioned as above.